On An Overgrown Path: Who needs music? 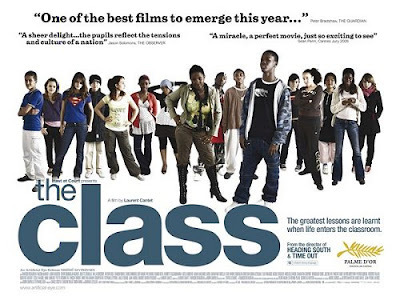 Laurent Cantet's film The Class ( French title Entre les murs) won the 2008 Cannes Palme d'Or and was a 2009 Oscar nominee, so it doesn't need me to tell you how good it is. But when we saw The Class at the Cambridge Arts Cinema last Wednesday I noticed one interesting point that seems to have passed the critics by. Throughout 128 minutes of spell-binding cinema Laurent Cantet's film does not use one single note of soundtrack music. But that is not a (silent) record. Another highly acclaimed European film ran for 169 minutes with using any music. This is the trailer (with added background music) for Entre les Murs, in French with no sub-titles. But you don't need to speak French to appreciate the masterful performance of François Bégaudeau as the teacher. Not only is François Bégaudeau centre screen for the entire film, he also wrote the book on which the film is based, and was a member of the 1990s punk rock group Zabriskie Point. From where it is a short path to Rhythm Is It! Another interesting point. François Bégaudeau, who has the leading role in the film, does not appear on the film poster or on the DVD packaging. I'm (like many) a great fan of The Wire - the HBO series. It uses no background music and only uses feature tracks at the very beginning and end. It's a sign of an exceptional script. I love the bit in Blazing Saddles when the lead character trots past Count Basie's band in the middle of the desert.